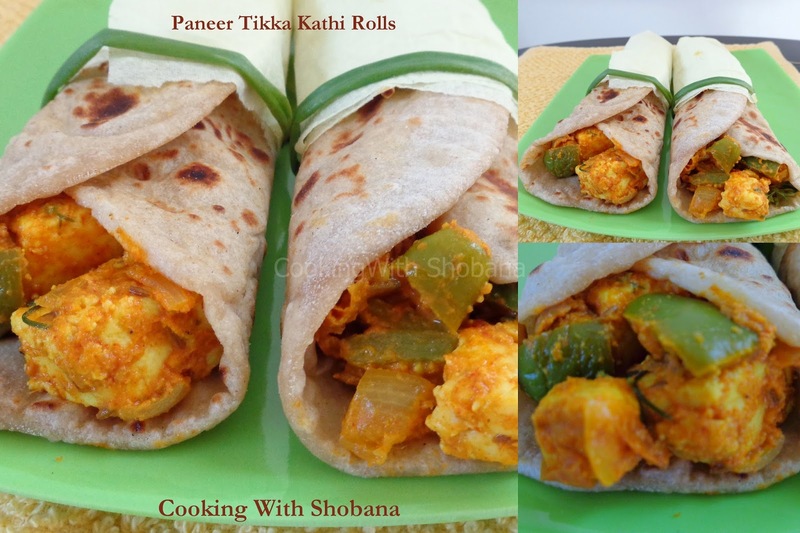 Today's recipe has a spicy paneer filling stuffed in chapati rolls. These are enjoyed as a snack in Punjabi cuisine. I served this for brunch and it was much appreciated. The success of this dish depends, I feel, on how well the paneer is marinated. While eating them in the form of rolls has its own charm, if you are serving them as starters, you can cut them into 2 " pieces and serve them. First, prepare the marinade. In a deep bowl of glass or food safe plastic, combine all the ingredients listed under (b) above. Marinate for 10 minutes. Keep aside. Cook till the liquid evaporates. Your paneer tikka filling is ready. Keep aside. Keep each of the portions in the centre of a chapati and roll tightly. You can use a toothpick to keep the rolled chapati in place. Heat the rolls on a tawa serve. Wrap the chapati rolls in tissue paper or aluminium foil. Here I have tied them with spring onion after wrapping them in tissue paper. Alternatively, without wrapping them, you can serve these hot, cut into 2 " long pieces.